The model overhaul at Mercedes-Benz is set to continue with the manufacturer revealing the new version of the SLK Roadster. Following on from the new C-Class Estate and Saloon models, the car maker's Roadster has been given some design tweaks along with new engines and interesting tech. The three engines available from sale are new direct injection versions all badged BlueEfficiency. There are two four-cylinder options, the 200 with 181bhp and the 250 with 201bhp. The 200 will reach 62mph in 7s while achieving 46.3mpg with the 250 covering the sprint in 6.6s with efficiency figures of 45.5mpg. This is when both are fitted with the optional seven-speed Tronic Plus automatic gearbox. Also on offer is a range-topping V6 engine, the 350 BlueEFFICIENCY. This produces 302bhp meaning you'll hit the 62mph benchmark in 5.6s but achieve a reasonable 39.7mpg at the same time. All engines come with start/stop for maximum fuel efficiency. 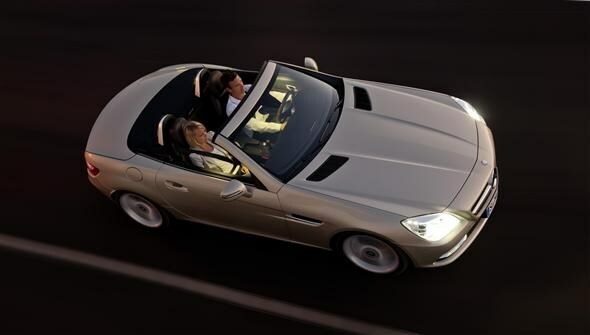 While there are plenty of changes for the SLK, the highlight is the optional 'Magic Sky Control' roof. This glass roof switches from light or dark with the touch of a button. This means you can have a transparent roof or a dark roof if you need some shade. To keep driver and passenger warm with the roof down, it comes with Airguide - a system where transparent plastic panels fitted to the back of the roll bars can be moved to the centre to calm the breeze. Buyers get a choice of three suspension set-ups with the Dynamic Handling package available. This comes with continuous adjustable damping to settle the car on poor surfaces. On the outside the car gets a new grille and headlight design made up of LED lights. While the design has been moved on much of the look resembles that of the original 1950s SL. Inside it is the usual mix of high-end materials and finishes with a number of different high-gloss wood options available and a brushed steel finish. 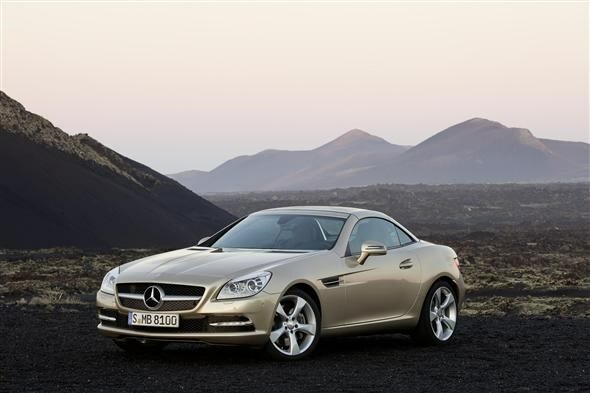 The new SLK goes on sale in June this year with prices expected to start at around £31,000.